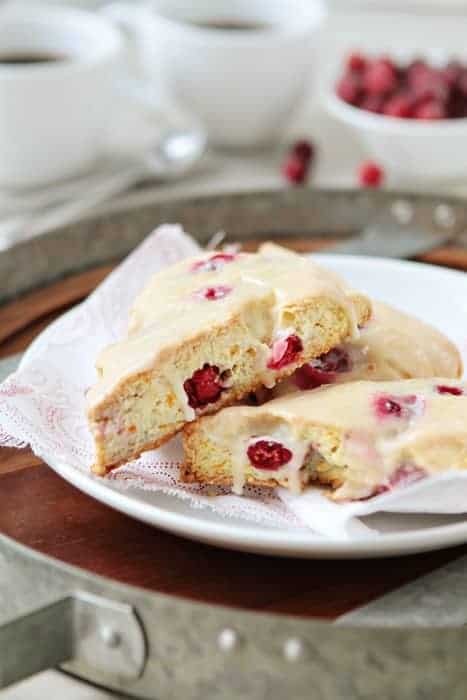 Cranberry Orange Scones drenched in vanilla glaze. If you’ve followed My Baking Addiction for a little while, you know that I’ve divulged my hoarding ways with baking ingredients on countless occasions. From canned pumpkin towers to pounds upon pounds of unsalted butter in the freezer, I like to be prepared. Prepared for what? I have no idea. I get especially hoarder-ish during the holiday season and if you opened my freezer right about now, you’d think my local market was giving away fresh cranberries. Nope. I purchased every bag – and pretty much tossed one into the cart on every shopping trip from November through January. During those months I was super duper pregnant, so although I was craving all things flecked with festive cranberries, I certainly wasn’t making much of anything aside from PB&Js. A few days before I gave birth to Elle, I got a random burst of energy and crazy strong hankering for scones. Starbucks was simply out of the question due to incredibly cold temperatures and a stupid amount of snow, so I decided to crank up the oven, grate some butter and make Cranberry Orange Scones. And then it took me about a month to post them. Which means my baby is 3 weeks old. Not possible. 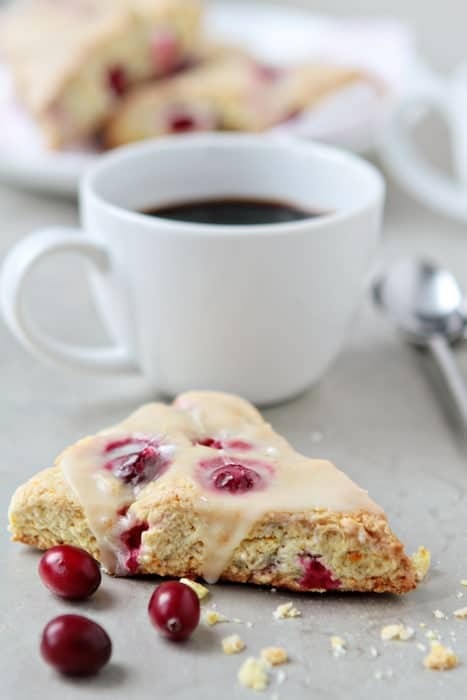 Crazy delay in posting aside, Cranberry Orange Scones are pretty much heaven in scone form. They’re tender, slightly sweet and drenched in a vanilla glaze that makes them even more incredible. And if you’re not a fresh cranberry hoarder like myself, they’re just as delicious with dried cranberries. Do you hoard ingredients? What’s your guilty pleasure? 1. Adjust oven rack to lower-middle position and preheat oven to 400 degrees. Line a baking sheet with parchment paper. 2. In a medium bowl, combine sugar and orange zest; mix with your fingertips until the sugar is moistened and fragrant. Add in the flour, baking powder, baking soda and salt and mix until combined. 3. Grate butter into flour mixture on the large holes of a box grater; use your fingers to work in the butter until the mixture resembles coarse meal. 4. In a small bowl, whisk the sour cream and egg until smooth. 5. Using a fork, stir sour cream mixture into flour mixture until large dough clumps form. Add in cranberries. Use your hands to press the dough against the bowl into a ball. The dough will be sticky first, but as you press, the dough will come together. 6. Place on a lightly floured surface and pat into a 7-inch circle about 3/4-inch thick. Use a sharp knife to cut into 8 triangles; place on prepared baking sheet, about 1 inch apart. Bake until golden, about 15 to 17 minutes. Cool for 10 minutes and prepare the glaze. 7. In a medium bowl, prepare the glaze by mixing together the melted butter, confectioners’ sugar, vanilla and orange juice. Whisk until smooth. Dip the top of the scones into the glaze and allow the glaze to harden. At this point, you can leave them as is or go for the double dip. I glazed my scones twice. -Scones store well in an airtight container for up to two days. My Baking Addiction adapted from Pam Anderson via All Recipes. I do the exact same thing with cranberries every year. So, I have plenty enough to make these. Can’t wait! I absolutely LOVE the cranberry orange combination! I’m adding these to my must bake list for my family this weekend! Great recipe! Gorgeous photos, Jamie! I have been craving scones lately so I think these will be making an appearance in my kitchen this weekend. These sound lovely!! Such an awesome flavour! I love anything with cranberries in it but am bound by them being seasonal – please can you tell me how you go about freezing them? Congrats on your new baby! These scones look delicious! I love scones and these are perfect! You should see my pantry right now! My husband scours the clearance racks at our grocery store and anytime canned goods or anything else he knows I could use goes on clearance he buys it all up, which means I too, have a million cans of dented pumpkin puree in my pantry and I love it! Congratulations on your new baby! I love scones, and especially love an orange and cranberry combination! A nice sweet glaze to compliment the tartness is perfect! Thanks so much for sharing! Can’t wait to try it. hehe! I love that you had tons of food and were super pregnant, but still only ate pb&j! These scones look great! I hoard spices. I have a million of them. Nothing better on a cold morning then a warm scone and coffee. Look forward to trying the recipe! There’s nothing like a hot, buttery scone right from the oven. These look wonderful. I always have at least 4 pounds of butter stashed in my freezer at all times. Running out is not an option. Pinned. These look scrum-diddly-umptious! Love scones, can’t wait to try out this recipe. I just had a baby on Feb 12th…congrats on your new little one! I have been craving scones too, so I think I will have to make these this weekend. I have a stockpile of cranberries in my freezer from the holidays just begging to be used! Hi, in Brazil is difficult to find cranberries! Is it possible change cranberries for strawberries?? Thanks! Sure you can. The scones will have a very different flavor, but I think they’d still be delicious. Made these today and they are UH.MAZE.ING! I’m so glad you enjoyed them! Thanks for visiting. I love this site and eveything I have ever made, so I was super excited to try these and I have to say that I was disappointed, as they burned and I didn’t even bake them as long as the directions stated for. Maybe, if I ever tried this particular scone again I would bake it at a lower temp. Hi, Mary! I’m so sorry the scones didn’t turn out the way you hoped. Let me know if you try them again. I hope the results are better! I made these today…. Delicious! I baked a couple minutes longer to crisp slightly. My boyfriend and I loved them! I was surprised how that the cranberries were which we actually really enjoyed. I’m so glad you and your boyfriend enjoyed them, Loralei! So easy, even a male cooking novice (erh, that would be me), with few cooking instincts, can do this without producing flat, tasteless rocks. Could be our oven, but nearly every baking recipe (breads, cakes, scones) I’ve tried needed about 20 degrees cooler setting and 10 minutes shorter time not to overcook. Icing nice, but gonna look up some kind of Crème Fraîche topping/dip/substitute and get daring next time. I’m glad you enjoyed the scone, Danny. The creme fraiche topping sounds amazing!